Background: Some male survivors of childhood cancer are suffering from azoospermia. In addition, spermatogonial stem cells (SSCs) are necessary for the improvement of spermatogenesis subsequent to exposure to cytotoxic agents such as cisplatin. Objective: The aim of this study was to evaluate the anticancer activity of cisplatin-loaded folic acid-conjugated poly(lactic-co-glycolic acid) (PLGA) nanoparticles (NPs) on mouse malignant cell line (EL4) and SSCs in vitro. 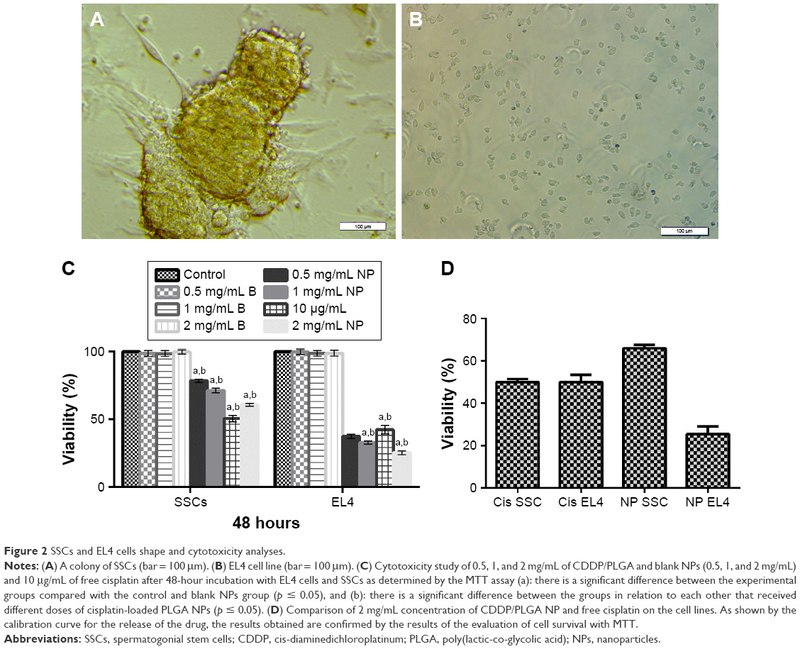 Methods: SSCs were co-cultured with mouse malignant cell line (EL4) cells and divided into four culture groups: 1) control (cells were co-cultured in the culture medium), 2) co-cultured cells were treated with cisplatin (10 μg/mL), 3) co-cultured cells were treated with cisplatin-loaded folic acid-conjugated PLGA NPs, and 4) co-cultures were treated with folic acid-conjugated PLGA for 48 hours. The NPs were prepared, characterized, and targeted with folate. 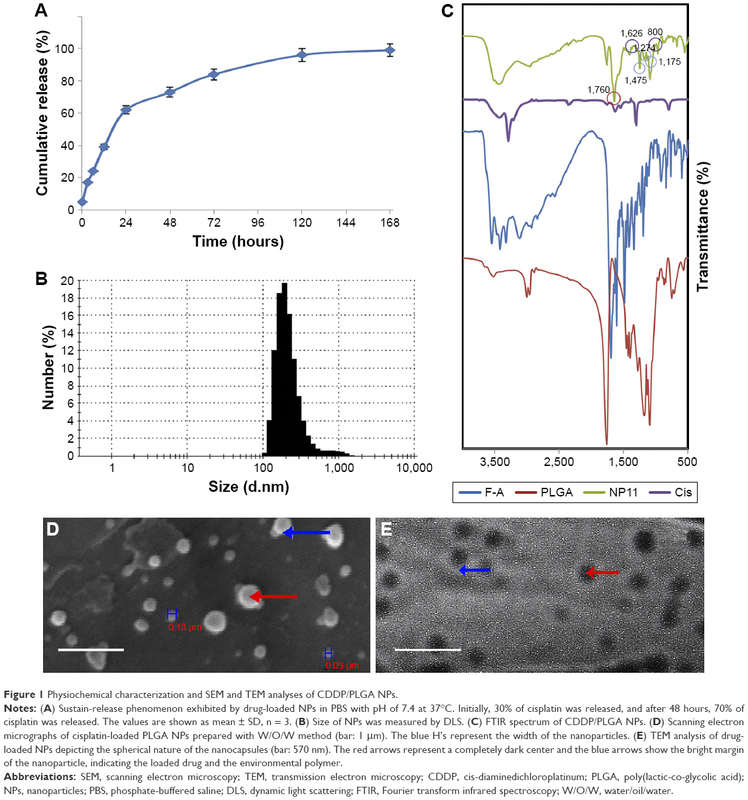 In vitro release characteristics, loading efficiency, and scanning electron microscopy and transmission electron microscopy images were studied. Cancer cells were assayed after treatment using flow cytometry and TUNEL assay. The co-cultures of SSCs and EL4 cells were injected into seminiferous tubules of the testes after treating with cis-diaminedichloroplatinum/PLGA NPs. Results: The mean diameter of PLGA NPs ranged between 150 and 250 nm. The number of TUNEL-positive cells increased, and the expression of Bax and caspase-3 were upregulated in EL4 cells in Group 4 compared with Group 2. There was no pathological tumor in testes after transplantation with treated co-cultured cells. Conclusion: The PLGA NPs appeared to act as a promising carrier for cisplatin administration, which was consistent with a higher activation of apoptosis than free drug. For the potential clinical application of restoring fertility after anticancer therapy, and based on the promising data on sorting of SSCs from tumoral cells in previous reports, in this work we developed cisplatin-loaded folic acid-conjugated PLGA NPs to investigate elimination of EL4 cancer cells from SSCs, aiming to achieve a controlled inhibition of tumoral cell proliferation induced by drug delivery. Cisplatin (cis-platinum diammine dichloride), PLGA (Resomer RG502H) with a 50:50 mole ratio of glycolic acid to lactic acid and a molecular weight of 12,000 g/mol, polyvinyl alcohol (PVA; 89 mol% hydrolyzed), Span 60 (s7010), and Tween 60 (p1629) were purchased from Sigma (St Louis, MO, USA). In this experiment, 60 neonatal mice between 3 and 6 days old were used. These animals were obtained from the National Medical Research Institute (NMRI), originally taken from stocks of Razi Laboratory (Tehran, Iran). They were kept in cages made of plastic in a room at a temperature range of 22°C–25°C, with a 12-hour light/dark cycle. The research was approved by Research Ethics Committee of Iran University of Medical Sciences and was in accordance with the National Research Council guidelines (code: 21650). EL4 cell line and neonatal mouse SSCs were prepared, and the cultures were initiated as described earlier.23 The mouse acute lymphoblastic leukemia cell line EL4 was provided by the culture collection of Pasteur Institute, Tehran, Iran, and the isolation of SSCs from mice in this research was performed after obtaining ethical approval. The SSCs co-cultured with testicular cell suspensions were contaminated with 5% EL4 cells at 37°C in a 5% CO2 atmosphere in DMEM/F12 medium (Gibco) supplemented with 2% fetal bovine serum, penicillin (100 U/mL), streptomycin (100 μg/mL), and gentamycin (40 μg/mL). In our previous study, the identity of the cultured cells was confirmed by the expression of specific markers (alpha-6-integrin and c-kit positive for SSCs and H-2Kb positive for EL4 cells). In addition, functional transplantation assay for SSCs and tumorigenicity assays for EL4 cells were performed in recipient busulfan-treated testes. In this study, EL4 and SSCs were classified into four groups as follows: Group 1 was control (received medium); Group 2 received blank NPs in the medium; Group 3 received an effective dose of cisplatin (10 μg/mL);23 and Group 4 received cisplatin-loaded folic acid-conjugated PLGA NPs. Preparation of nanocapsule containing cisplatin was performed using a modified water/oil/water (W/O/W) double-emulsion solvent evaporation procedure,31 with some modification. Briefly, cisplatin and distilled water (DW) mixture was prepared by dissolving cisplatin in DW. This mixture was blended in dichloromethane (DCM) solution of the polymer (PLGA and Span 60) by ultrasonication for 45 seconds (power 50 W) in an ice bath to obtain a water-in-oil emulsion. Then, this emulsion was proximately dispensed into a 12 mL aqueous solution of PVA (2%, w/v) containing Tween 60, and the mixture was ultrasonicated again. The solvent exclusion of the final double emulsion (W/O/W) was carried out via vaporization, and complete dispersion was done through mechanical stirring. For vaporization, the resulting double emulsion was diluted in an aqueous solution of PVA under mechanical stirring for a period of 3 hours at room temperature to allow the evaporation of DCM. Finally, drug-loaded NPs were collected by centrifugation and washed three times with deionized water. The obtained nanocapsules were dried by freeze-drying and stored at 4°C. Blank NPs were prepared by the method described above except for the addition of cisplatin. In brief, folic acid was reacted with dicyclohexylcarbodiimide and N-hydroxysuccinimide (NHS) in DMSO with stirring. The activated folate was then reacted overnight with ethylene diamine in the presence of pyridine (0.2 mL) as a catalyst. The aminated folate (Fol-NH2) was precipitated out by adding excess of cold acetonitrile, followed by vacuum filtration. For conjugation of Fol-NH2 onto the surface of PLGA NPs, 10 mg of cisplatin-loaded NPs was dispersed in 5 mL of phosphate-buffered saline (PBS; 0.02 M, pH 7.4), followed by addition of ethyl(dimethylaminopropyl) carbodiimide (EDC) and NHS to the above suspension. EDC activation was carried out by agitating the above suspension for 2 hours at room temperature using a magnetic stirrer. The excess of unreacted EDC and NHS was removed, and activated NPs were recovered by ultracentrifugation. The activated NPs were dispersed in PBS (0.02 M, pH 7.4), followed by the addition of Fol-NH2 solution (1 mg/mL in PBS).32 The solution was again agitated at room temperature, and excess of unconjugated folate was removed by ultracentrifugation. The recovered folate-conjugated NP suspension was lyophilized. Conjugation of folate onto PLGA NPs surface was confirmed by Fourier transform infrared spectroscopy (FTIR) analysis. Absorption measurements were performed to determine the amount of drug encapsulated in PLGA using UV–vis spectrophotometer (model UV-1650 PC; Shimadzu Europe, Tokyo, Japan). First, 5 mg of the dry PLGA nanocapsules was dissolved in 1 mL DCM. Then, 1 mL of PBS (pH 7.4) was added. For precipitating polymer phase from aqueous phase, centrifugation was performed at 10,000 rpm for 20 min. The drug loading of this solution was determined by measuring the absorption peak at 300 nm with a UV–vis spectrophotometer, and quantitatively determined by comparison with a previously established standard curve. The concentration of cisplatin was investigated using Beer’s law. The results of the experiment are expressed as the average of three different analyses. In addition, for determining the in vitro release of cisplatin from NPs, 5 mg of nanocapsule powder was suspended in 5 mL of PBS (pH 7.4). The suspension was incubated at 37°C. The tubes were centrifuged at definite time intervals. After centrifugation, the supernatants were collected for the determination of cisplatin, analyzed using the UV–vis spectrophotometer by measuring the absorption peak at 300 nm, and replaced by the same quantity of fresh PBA solution. The tubes were then placed back in the incubator. The particle size of the nanocapsules was determined by dynamic light scattering (DLS) on a Nano-ZS system (Model ZEN3600; Malvern Instruments, Malvern, UK) using a zeta sizer. In brief, 1 mg/mL of NP suspension was prepared in MilliQ water, and sonicated for 30 seconds over an ice bath using a sonicator (with 50 W energy output) to avoid the formation of large aggregates. The zeta potential of the nanoformulations was determined by the same instrument, following the above protocol, before and after folate conjugation. All measurements were performed in triplicates. The NPs were evaluated for size by TEM (LEO 906; Carl Zeiss). After sonicating for 5 min, one drop of NP suspension (1 mg/mL) was placed on a carbon-coated copper TEM grid and dried in the open air before negative staining with uranyl acetate solution (1%). Size and surface morphology of nanocapsules were investigated by SEM with Vega-II from Tescan Co. (Brno, Czech Republic). The samples for SEM analysis were put under vacuum and sputter-coated with gold. The infrared spectra of cisplatin, PLGA, folic acid, and cisplatin-loaded folate-conjugated PLGA NPs were recorded using a Fourier transform infrared spectrophotometer (FTIR-ATR-Perkin Elmer 2000). The spectra of all the materials were recorded at a frequency range of 500–4,000 cm−1 and averaged over four runs. The powdered samples were placed on the attenuated total reflectance crystal, and then compressed using an axial screw. MTT assay was performed to evaluate the toxicity of blank NPs and cisplatin-loaded PLGA NPs and that of free cisplatin against EL4 cancer cells and SSCs separately. The cells (5 × 103 per well) were seeded in 96-well plates. After treating with various concentrations of NPs (0.5, 1, and 2 mg/mL) and 10 μg/mL free cisplatin for 48 hours, the culture medium was removed and 10 μL/well MTT solution (5 mg/mL) was added, plates were incubated at 37°C for 3 hours, and then the medium was replaced with 100 μL of DMSO to dissolve the formazan crystals. The absorbance was measured at 570 nm using a microplate reader. The experiments were performed three times. EL4 cells (5,000 per well) were incubated with 10 μg/mL cisplatin and cisplatin-loaded PLGA NPs. After 48 hours of incubation, apoptosis was detected by TUNEL assay. TUNEL staining was carried out using an In-Situ Cell Death Detection Kit (Roche, Basel, Switzerland) according to the provided protocol. The effect of free cisplatin and cisplatin-loaded PLGA NPs on Bax, bcl2, and caspase-3 gene level in EL4 cells was investigated by real-time quantitative PCR analysis. Briefly, EL4 cells were incubated with 10 μg/mL concentrations of cisplatin and 2 mg/mL of NPs for 48 hours. Total mRNA was isolated, and real-time PCR amplification of cDNAs was performed following the protocol. The relative quantification of gene expression was performed using GAPDH as an internal control. After co-culture of SSCs and EL4 cells with 10 μg/mL concentration of cisplatin, blank NPs, and cisplatin-loaded PLGA NPs for 48 hours, the cells were incubated with an FITC-conjugated mouse anti-H-2Kb monoclonal antibody (553569; Pharmingen) at 1:50 concentration and phycoerythrin-conjugated rat anti-CD49f monoclonal antibody (ab95703; Abcam, Cambridge, UK) (concentration of 1:10) for 20 min at 4°C in the dark. All quantitative data derived from this study were analyzed statistically and presented as mean ± SD. Statistical significance was determined using the one-way ANOVA test, followed by the post hoc Tukey’s test. The cell percentages determined using flow cytometry were compared using an independent t-test. P-values less than 0.05 were considered significant. The release of cisplatin from the prepared nanocapsules was evaluated in a PBS release medium with a pH of 7.4 at 37°C. The drug release was determined at definite intervals up to 7 days. The resulting curves exhibited a biphasic drug release pattern that was characterized by an initial rapid phase followed by a slower, continuous-release phase during 1 week (Figure 1A). The release of cisplatin from NPs was slightly faster in the first 48 hours; during this period, 70% of cisplatin was released. After 168 hours of incubation, about 97% of cisplatin was released from the CDDP/PLGA NPs at pH 7.4. The loading efficiency of cisplatin was calculated from the amount of recovered cisplatin from each batch relative to the initial amount of cisplatin used in the preparation process, and it was found to be about 78% ± 2.1%. The release of drugs from folate-conjugated NPs almost mimicked the pattern of unconjugated NPs release (data not shown). DLS analysis revealed that the NPs had a mean hydrodynamic diameter of 235 ± 7.3 nm with a polydispersity index of 0.585 and a negative zeta potential of −9 to −14.5 mV (Figure 1B). These negative values were due to the ionization of carboxyl groups on the surface of the nanocapsules. The surface modification of PLGA-NPs with folate had no significant effect on their size characteristics; however, zeta potential changed to 2.6 ± 0.8 mV which indicated the presence of folic acid. The conjugation of folate to PLGA NPs and loading of the drug were confirmed by FTIR analysis, and the peaks at 1,475, 1,274, and 1,170 cm−1 in folate-functionalized NPs clearly indicated the formation of amide bond following conjugation (Figure 1C). The small new peaks at 800 and 1,626 cm−1 seen in cisplatin-loaded NPs proved the presence of the drug in NPs. Figure 1 Physiochemical characterization and SEM and TEM analyses of CDDP/PLGA NPs. Notes: (A) Sustain-release phenomenon exhibited by drug-loaded NPs in PBS with pH of 7.4 at 37°C. Initially, 30% of cisplatin was released, and after 48 hours, 70% of cisplatin was released. The values are shown as mean ± SD, n = 3. (B) Size of NPs was measured by DLS. (C) FTIR spectrum of CDDP/PLGA NPs. (D) Scanning electron micrographs of cisplatin-loaded PLGA NPs prepared with W/O/W method (bar: 1 μm). The blue H’s represent the width of the nanoparticles. (E) TEM analysis of drug-loaded NPs depicting the spherical nature of the nanocapsules (bar: 570 nm). The red arrows represent a completely dark center and the blue arrows show the bright margin of the nanoparticle, indicating the loaded drug and the environmental polymer. Abbreviations: SEM, scanning electron microscopy; TEM, transmission electron microscopy; CDDP, cis-diaminedichloroplatinum; PLGA, poly(lactic-co-glycolic acid); NPs, nanoparticles; PBS, phosphate-buffered saline; DLS, dynamic light scattering; FTIR, Fourier transform infrared spectroscopy; W/O/W, water/oil/water. The SEM images showed the outer surface of nanocapsules. It was obvious that the nanocapsules had a smooth surface and were sphere-shaped (Figure 1D). The micrographs obtained from the TEM analysis gave some information about the structure, internal morphology, particle size, and distribution of the nanocapsules. Figure 1E shows the TEM micrographs of the CCDP/PLGA sample, which illustrates the spherical structure of the nanocapsules with the particle size in the range of 150–250 nm and their sizes consistent with DLS results. Indeed, no aggregation of nanocapsules was found while they were discrete due to negative surface charge according to zeta potential results. The cytotoxicity of CDDP/PLGA NPs, free cisplatin, and blank NPs on SSCs and EL4 cell lines was investigated using MTT assays (Figure 2A–D). As shown in Figure 2C, both cell lines were treated with varying concentrations of 0.5, 1, and 2 mg/mL of CDDP/PLGA and blank NPs and 10 μg/mL of free cisplatin for 48 hours on the basis of a previous study (time and dose of drug). To determine the best effect of NPs on the elimination of tumoral cells, cell viability was evaluated 48 hours following exposure with free cisplatin. The EL4 survival rates were found to be about 37.57% ± 0.55%, 32.79% ± 0.39%, and 25.42% ± 0.36% at the concentrations of 0.5, 1, and 2 mg/mL of CDDP/PLGA NPs, respectively. However, SSCs survival rates were found to be about 78.50% ± 1.34%, 71.34% ± 0.46%, and 60.74% ± 0.44% at the concentrations of 0.5, 1, and 2 mg/mL of CDDP/PLGA NPs, respectively. As shown in Figure 2C, the viabilities of EL4 cells and SSCs treated with 0.5, 1, and 2 mg/mL of blank NPs were similar to those of the control group (no significant difference) at all tested concentrations in 48 hours, revealing the low toxicity and biocompatibility of the copolymers to the cells. As shown in Figure 2D, 2 mg/mL concentration of CDDP/PLGA NPs and free cisplatin were compared to each of the cell lines. The EL4 IC50 and SSCs IC50 for the group that received the effective dose of cisplatin (10 μg/mL) were 8 and 6.5 μg/mL, respectively. However, the survival rate of tumor cells that received 2 mg/mL of NPs was 25.42% ± 3.6% for EL4 cells and 66.04% ± 1.6% for SSCs. Figure 2 SSCs and EL4 cells shape and cytotoxicity analyses. Notes: (A) A colony of SSCs (bar = 100 μm). (B) EL4 cell line (bar = 100 μm). (C) Cytotoxicity study of 0.5, 1, and 2 mg/mL of CDDP/PLGA and blank NPs (0.5, 1, and 2 mg/mL) and 10 μg/mL of free cisplatin after 48-hour incubation with EL4 cells and SSCs as determined by the MTT assay (a): there is a significant difference between the experimental groups compared with the control and blank NPs group (p ≤ 0.05), and (b): there is a significant difference between the groups in relation to each other that received different doses of cisplatin-loaded PLGA NPs (p ≤ 0.05). (D) Comparison of 2 mg/mL concentration of CDDP/PLGA NP and free cisplatin on the cell lines. As shown by the calibration curve for the release of the drug, the results obtained are confirmed by the results of the evaluation of cell survival with MTT. Abbreviations: SSCs, spermatogonial stem cells; CDDP, cis-diaminedichloroplatinum; PLGA, poly(lactic-co-glycolic acid); NPs, nanoparticles. The apoptotic characteristics of the cancer cells in the group that received free cisplatin compared with the group that received NPs are shown in Figure 3. We selected random fields per sample and counted approximately 80 cells for each group. The number of TUNEL-positive EL4 cells increased to about 41.8 ± 1.6 with 10 μg/mL cisplatin treatment after 48-hour incubation. The treatment with 2 mg/mL of CDDP/PLGA NPs significantly increased apoptosis by 45.2% ± 1.2% compared to free cisplatin. These results indicated that a higher number of TUNEL-positive cells were undergoing apoptosis upon cisplatin treatment (p ≤ 0.05). In addition, we treated EL4 cells with 10 μg/mL cisplatin and 2 mg/mL cisplatin-loaded PLGA NPs for 48 hours, and examined the apoptotic gene expression by qRT-PCR. The expression of BAX and caspase-3 was increased in the group that received NPs after 48 hours of incubation compared with that in the group that received free cisplatin (Figure 3G and I). The results clearly showed a significant decrease in the expression of bcl-2 in the cells treated with 2 mg/mL CDDP/PLGA NPs compared with that in free cisplatin group (Figure 3H). The results clearly indicated an overexpression of the apoptotic gene and downregulation of antiapoptotic gene following the cisplatin treatment. Figure 3 TUNEL assay for EL4 cells treated with free cisplatin and 2 mg/mL of CDDP/PLGA NPs and comparison of the mRNA levels of apoptosis-related genes in the EL4 cells treated with cisplatin (10 μg/mL) and 2 mg/mL of cisplatin-loaded PLGA NPs for 48 hours. Notes: The green cells indicate the TUNEL-positive apoptotic cells. 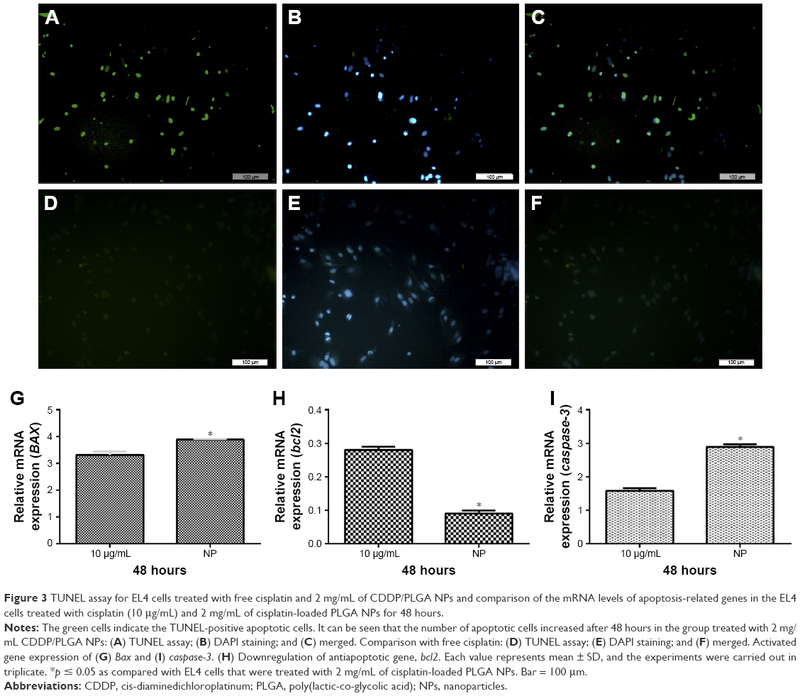 It can be seen that the number of apoptotic cells increased after 48 hours in the group treated with 2 mg/mL CDDP/PLGA NPs: (A) TUNEL assay; (B) DAPI staining; and (C) merged. Comparison with free cisplatin: (D) TUNEL assay; (E) DAPI staining; and (F) merged. Activated gene expression of (G) Bax and (I) caspase-3. (H) Downregulation of antiapoptotic gene, bcl2. Each value represents mean ± SD, and the experiments were carried out in triplicate. *p ≤ 0.05 as compared with EL4 cells that were treated with 2 mg/mL of cisplatin-loaded PLGA NPs. Bar = 100 μm. Abbreviations: CDDP, cis-diaminedichloroplatinum; PLGA, poly(lactic-co-glycolic acid); NPs, nanoparticles. The percentage of SSCs and EL4 in the co-culture was assayed by flow cytometry after treatment. The percentage of cells that expressed CD49f (alpha-6-integrin) was on an average of 59.64 ± 2.5 and the percentage of cells that expressed H-2Kb marker was about 0.8 ± 0.14 in the group that received folic acid-conjugated CDDP/PLGA NPs, whereas the percentage of SSCs and EL4 cells was 39.43 ± 6.33 and 1.90 ± 0.17, respectively, in the group that received free cisplatin (p ≤ 0.05). There was no significant difference in the percentage of SSCs and EL4 cells in the group that received blank NPs compared with the control group (Figure 4). 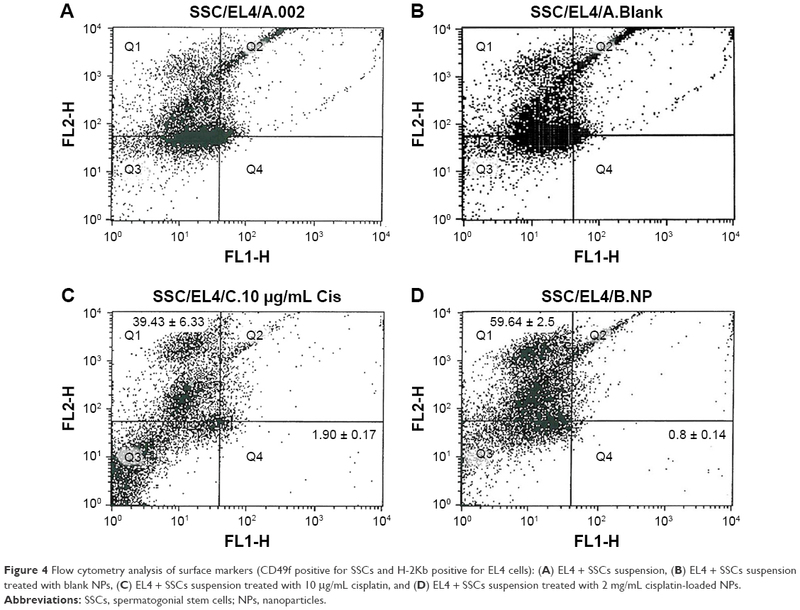 Figure 4 Flow cytometry analysis of surface markers (CD49f positive for SSCs and H-2Kb positive for EL4 cells): (A) EL4 + SSCs suspension, (B) EL4 + SSCs suspension treated with blank NPs, (C) EL4 + SSCs suspension treated with 10 μg/mL cisplatin, and (D) EL4 + SSCs suspension treated with 2 mg/mL cisplatin-loaded NPs. Abbreviations: SSCs, spermatogonial stem cells; NPs, nanoparticles. As mentioned, the co-culture of SSCs and EL4 cells was injected into the seminiferous tubules of the testes after treating with CDDP/PLGA NPs. No testes or seminiferous tubules tumor was observed in the histological sections 8 weeks after transplantation. Also, we observed DiI-labeled SCC proliferation and regional colonization of stem cells (Figure 5). Furthermore, SCCs transplantation improved the condition and structure of the seminiferous tubules in the busulfan-azoospermia model, indicating that spermatogenesis began in many seminiferous tubules. 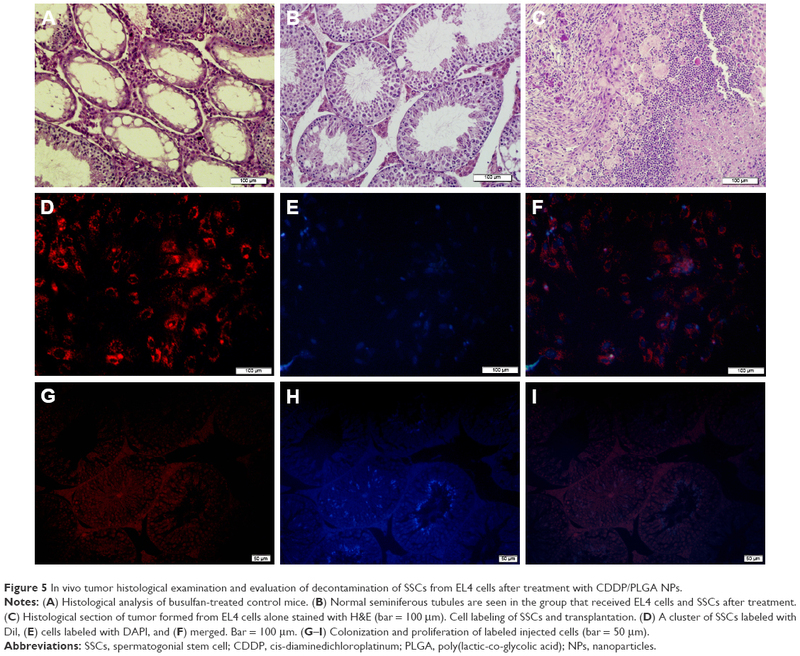 Figure 5 In vivo tumor histological examination and evaluation of decontamination of SSCs from EL4 cells after treatment with CDDP/PLGA NPs. Notes: (A) Histological analysis of busulfan-treated control mice. (B) Normal seminiferous tubules are seen in the group that received EL4 cells and SSCs after treatment. (C) Histological section of tumor formed from EL4 cells alone stained with H&E (bar = 100 μm). Cell labeling of SSCs and transplantation. (D) A cluster of SSCs labeled with DiI, (E) cells labeled with DAPI, and (F) merged. Bar = 100 μm. (G–I) Colonization and proliferation of labeled injected cells (bar = 50 μm). Abbreviations: SSCs, spermatogonial stem cell; CDDP, cis-diaminedichloroplatinum; PLGA, poly(lactic-co-glycolic acid); NPs, nanoparticles. Geens et al demonstrated that FACS and MACS purification is not sufficiently efficient to ensure a total depletion of malignant cells from a germ cell suspension and it induced leukemia in the recipients.12 Our results seem to contradict this promising report; however, a major problem is low efficiency of this cell-sorting technique because of low cancer cells detection. Although we were not able to entirely delete tumoral EL4 cells from SSCs, we did not find induced tumor in the recipients after the treatment for smart drug delivery. It appears from our results that more research on alternative decontamination techniques is necessary until the depletion of malignant cells reaches zero. Furthermore, the surface of NPs could have affected cisplatin delivery to cancerous cells while conjugated with the H-2Kb antibody (anti-EL4 cells). This recent method may be utilized for targeting applications or gene delivery to induce apoptosis as a novel cancer therapy. We conclude that cisplatin-loaded PLGA NPs have a significant effect on the elimination of tumoral cells from germ cells. Hence, we observed a controlled release of cisplatin from NPs as compared with free cisplatin. Our findings confirm that cisplatin-loaded NPs can serve as a novel tool for the isolation of SSCs from cancerous cells. A targeted delivery of cisplatin will improve the therapeutic efficacy of the drug and will be useful for decontamination of cancer cells. Overall, the results of this study suggest that cisplatin-loaded PLGA NPs induce apoptosis in EL4 cancer cells. Also, NP-mediated cisplatin delivery may further improve the therapeutic efficacy of free cisplatin. This work was supported by an Iran University of Medical Sciences (IUMS) grant (92-01-30-21650) and an INSF grant (92005090) for a PhD student thesis. All experiments were performed at the Cellular and Molecular Research Center (CMRC), IUMS, Tehran, Iran. Golan M, Feinshtein V, Polyak D, Scomparin A, Satchi-Fainaro R, David A. Inhibition of gene expression and cancer cell migration by CD44v3/6-targeted polyion complexes. Bioconjug Chem. 2016;27(4):947–960. Looijenga LH, Oosterhuis JW. Pathogenesis of testicular germ cell tumours. Rev Reprod. 1999;4(2):90–100. Kaatsch P. Epidemiology of childhood cancer. Cancer Treat Rev. 2010;36(4):277–285. Wallace WH, Kelsey TW, Anderson RA. Fertility preservation in pre-pubertal girls with cancer: the role of ovarian tissue cryopreservation. Fertil Steril. 2016;105(1):6–12. Howlader N, Noone AM, Krapcho M, et al. SEER Cancer Statistics Review, 1975–2008. Bethesda, MD: National Cancer Institute; 2011. Azizollahi S, Aflatoonian R, Sadighi Gilani MA, et al. Alteration of spermatogenesis following spermatogonial stem cells transplantation in testicular torsion-detorsion mice. J Assist Reprod Genet. 2016;33(6):771–781. Koruji M, Shahverdi A, Janan A, Piryaei A, Lakpour MR, Gilani Sedighi MA. Proliferation of small number of human spermatogonial stem cells obtained from azoospermic patients. J Assist Reprod Genet. 2012;29(9):957–967. Koruji M, Movahedin M, Mowla SJ, Gourabi H, Pour-Beiranvand S, Jabbari Arfaee A. Autologous transplantation of adult mice spermatogonial stem cells into gamma irradiated testes. Cell J. 2012;14(2):82–89. Mirzapour T, Movahedin M, Koruji M, Nowroozi MR. Xenotransplantation assessment: morphometric study of human spermatogonial stem cells in recipient mouse testes. Andrologia. 2015;47(6):626–633. Valli H, Gassei K, Orwig KE. Stem cell therapies for male infertility: where are we now and where are we going? In: Carrell DT, Schlegel PN, Racowsky C, Gianaroli L, editors. Biennial Review of Infertility. Cham: Springer; 2015:17–39. Jahnukainen K, Hou M, Petersen C, Setchell B, Söder O. Intratesticular transplantation of testicular cells from leukemic rats causes transmission of leukemia. Cancer Res. 2001;61(2):706–710. Geens M, Van de Velde H, De Block G, Goossens E, Van Steirteghem A, Tournaye H. The efficiency of magnetic-activated cell sorting and fluorescence-activated cell sorting in the decontamination of testicular cell suspensions in cancer patients. Hum Reprod. 2007;22(3):733–742. Dovey SL, Valli H, Hermann BP, et al. Eliminating malignant contamination from therapeutic human spermatogonial stem cells. J Clin Invest. 2013;123(4):1833–1843. Hermann BP, Sukhwani M, Salati J, Sheng Y, Chu T, Orwig KE. Separating spermatogonia from cancer cells in contaminated prepubertal primate testis cell suspensions. Hum Reprod. 2011;26(12):3222–3231. Valli H, Sukhwani M, Dovey SL, et al. Fluorescence- and magnetic-activated cell sorting strategies to isolate and enrich human spermatogonial stem cells. Fertil Steril. 2014;102(2):566.e7–580.e7. Fujita K, Ohta H, Tsujimura A, et al. Transplantation of spermatogonial stem cells isolated from leukemic mice restores fertility without inducing leukemia. J Clin Invest. 2005;115(7):1855–1861. Fujita K, Tsujimura A, Miyagawa Y, et al. Isolation of germ cells from leukemia and lymphoma cells in a human in vitro model: potential clinical application for restoring human fertility after anticancer therapy. Cancer Res. 2006;66(23):11166–11171. Hou M, Andersson M, Zheng C, Sundblad A, Söder O, Jahnukainen K. Decontamination of leukemic cells and enrichment of germ cells from testicular samples from rats with Roser’s T-cell leukemia by flow cytometric sorting. Reproduction. 2007;134(6):767–779. Valli H, Phillips BT, Shetty G, et al. Germline stem cells: toward the regeneration of spermatogenesis. Fertil Steril. 2014;101(1):3–13. Kartalou M, Essigmann JM. Recognition of cisplatin adducts by cellular proteins. Mutat Res. 2001;478(1–2):1–21. Madias NE, Harrington JT. Platinum nephrotoxicity. Am J Med. 1978;65(2):307–314. Shabani R, Ashtari K, Behnam B, et al. In vitro toxicity assay of cisplatin on mouse acute lymphoblastic leukaemia and spermatogonial stem cells. Andrologia. 2016;48(5):584–594. Haley B, Frenkel E. Nanoparticles for drug delivery in cancer treatment. Urol Oncol. 2008;26(1):57–64. Acharya S, Sahoo SK. PLGA nanoparticles containing various anticancer agents and tumour delivery by EPR effect. Adv Drug Deliv Rev. 2011;63(3):170–183. Sadat Tabatabaei Mirakabad F, Nejati-Koshki K, Akbarzadeh A, et al. PLGA-based nanoparticles as cancer drug delivery systems. Asian Pac J Cancer Prev. 2014;15(2):517–535. Low PS, Kularatne SA. Folate-targeted therapeutic and imaging agents for cancer. Curr Opin Chem Biol. 2009;13(3):256–262. Sudimack J, Lee RJ. Targeted drug delivery via the folate receptor. Adv Drug Deliv Rev. 2000;41(2):147–162. Low PS, Antony AC. Folate receptor-targeted drugs for cancer and inflammatory diseases. Adv Drug Deliv Rev. 2004;56(8):1055–1058. Ashjari M, Khoee S, Mahdavian AR. Controlling the morphology and surface property of magnetic/cisplatin-loaded nanocapsules via W/O/W double emulsion method. Colloids Surf A Physicochem Eng Asp. 2012;408:87–96. Das M, Sahoo SK. Folate decorated dual drug loaded nanoparticle: role of curcumin in enhancing therapeutic potential of nutlin-3a by reversing multidrug resistance. PLoS One. 2012;7(3):e32920. Ogawa T, Aréchaga JM, Avarbock MR, Brinster RL. Transplantation of testis germinal cells into mouse seminiferous tubules. Int J Dev Biol. 1997;41(1):111–122. Aliakbari F, Gilani MA, Amidi F, et al. Improving the Efficacy of Cryopreservation of Spermatogonia Stem Cells by Antioxidant Supplements. Cellular Reprogramming. 2016;18(2):87–95. Marcon L, Zhang X, Hales BF, Robaire B, Nagano MC. Effects of chemotherapeutic agents for testicular cancer on rat spermatogonial stem/progenitor cells. J Androl. 2011;32(4):432–443. Shams A, Eslahi N, Movahedin M, Izadyar F, Asgari H, Koruji M. Future of spermatogonial stem cell culture: application of nanofiber scaffolds. Curr Stem Cell Res Ther. 2017;12(7):544–553. Cheng L, Jin C, Lv W, Ding Q, Han X. Developing a highly stable PLGA-mPEG nanoparticle loaded with cisplatin for chemotherapy of ovarian cancer. PLoS One. 2011;6(9):e25433. Menale C, Piccolo MT, Favicchia I, et al. Efficacy of piroxicam plus cisplatin-loaded PLGA nanoparticles in inducing apoptosis in mesothelioma cells. Pharm Res. 2015;32(2):362–374. Yang YY, Chung TS, Bai XL, Chan WK. Effect of preparation conditions on morphology and release profiles of biodegradable polymeric microspheres containing protein fabricated by double-emulsion method. Chem Eng Sci. 2000;55(12):2223–2236. Xu P, Van Kirk EA, Murdoch WJ, et al. Anticancer efficacies of cisplatin-releasing pH-responsive nanoparticles. Biomacromolecules. 2006;7(3):829–835. Ashjari M, Dehfuly S, Fatehi D, Shabani R, Koruji M. Efficient functionalization of gold nanoparticles using cysteine conjugated protoporphyrin IX for singlet oxygen production in vitro. RSC Adv. 2015;5(127):104621–104628. Wang D, Lippard SJ. Cellular processing of platinum anticancer drugs. Nat Rev Drug Discov. 2005;4(4):307–320.